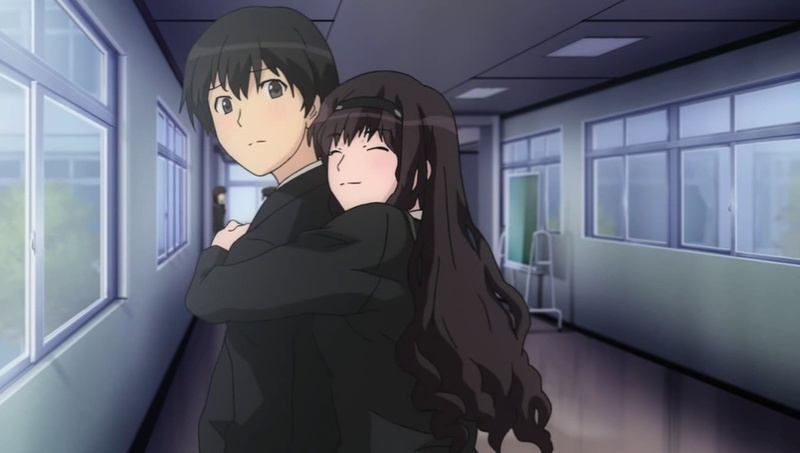 Since the beginning, Amagami SS gave the feeling that I've seen something very similar before. Then I remembered, everything in this anime, art style, story, even the strange logic in the thought process are almost completely identical to Kimikiss. So I went to look it up. Just as I thought, both games (Kimikiss and Amagami) are developed by the same company -- Enterbrain. Knowing that, there are a couple of thing I can probably safely predict. For one, it's probably going to have a "everything works out" happy ending like Kimikiss did. I'm not so against this kind of ending, except there's no excitement at all for this type of ending. I mean really, what's the point of watching a story when the story only goes from "good" to "better" in a highly predictable manner? This is one of those "feel good" anime that all it does is to show you how things would be if everything goes right -- a situation only occurs in fictions. I might sound a bit overly critical, but by no means I'm trying to say this is a bad anime. In fact, I think it's pretty interesting so far. The only thing I'd like to warn you about is that it seems the anime carried a bit more perversion over from the game than Kimikiss did. I think they went just a bit overboard on that. T__T you there Evil Cat?? ?